You are a Special Blend! This two-toned coffee theme card with its fun sentiment could make for a nice Father’s day card for the special dad that loves his coffee. I know in our house that sure is true. This card boasts shades of blue ocean with a hint of dramatic black all using one of my favorite inks—VersaFine Clair. Continue reading to see how I made this card! 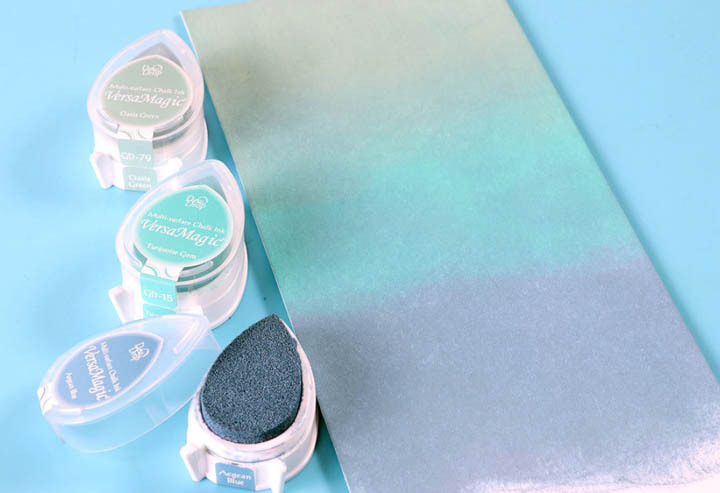 Use the direct to the paper method to ink a piece of cardstock from top to bottom in sections using your VersaMagic DewDrops. Start with your lightest color first moving to the darkest color. And let dry completely. 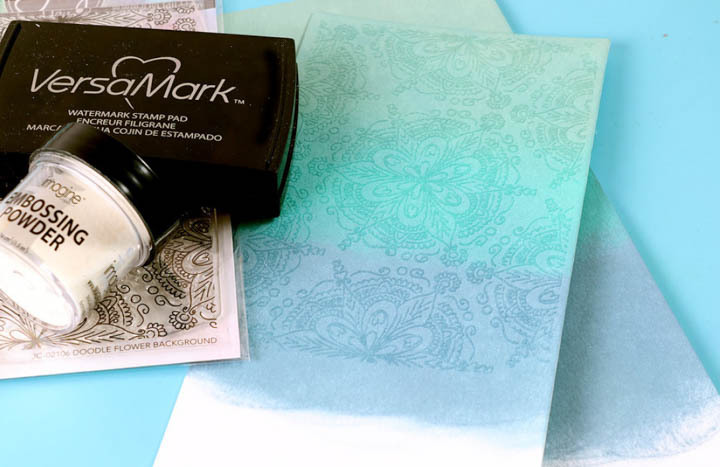 Position your stamp and cardstock piece in the MISTI Stamping Tool and stamp the background image in VersaMark ink and then sprinkle with clear embossing powder. Remove excess and heat set image. 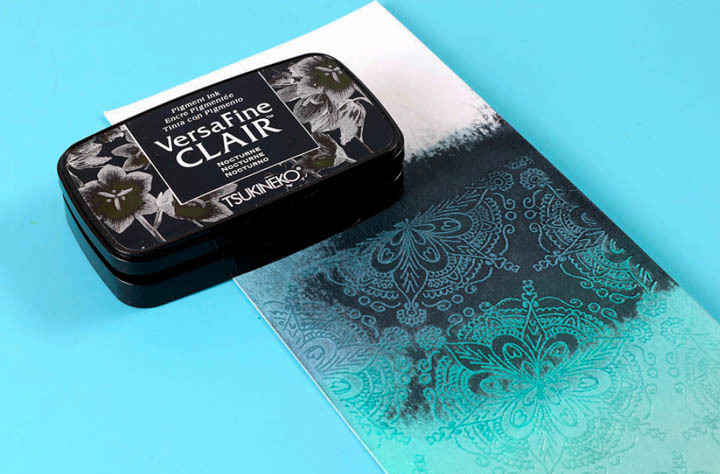 Use Nocturne VersaFine Clair ink to ink over a portion of entire embossed piece. Use a soft damp cloth to gently wipe the embossed areas clean from the black ink and reveal the colored image underneath. Ink the card only one-third of the way. I am using a band to mask the area area where it is ink over and where it is not. But you could mask off a line with washi tape if you wanted a strong edge. Trim a piece of specialty paper to 2 inches tall and 5 – 6 inches—long enough to wrap around your card. 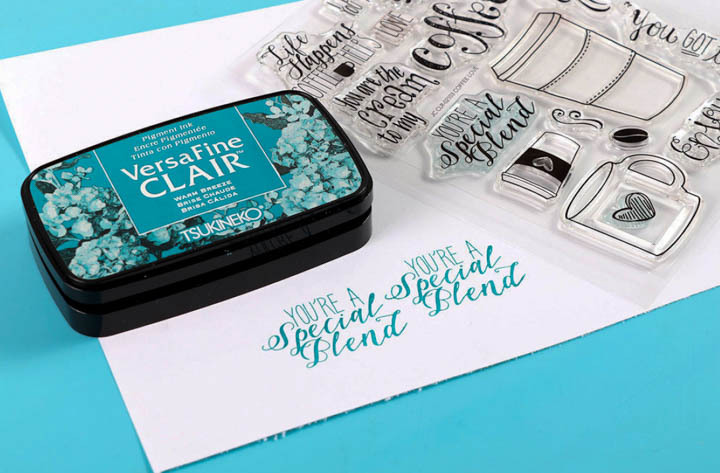 Stamp “You’re A Special Blend” sentiment from your Coffee Lovers set repeatedly in VersaFine Clair Warm Breeze across the paper band. 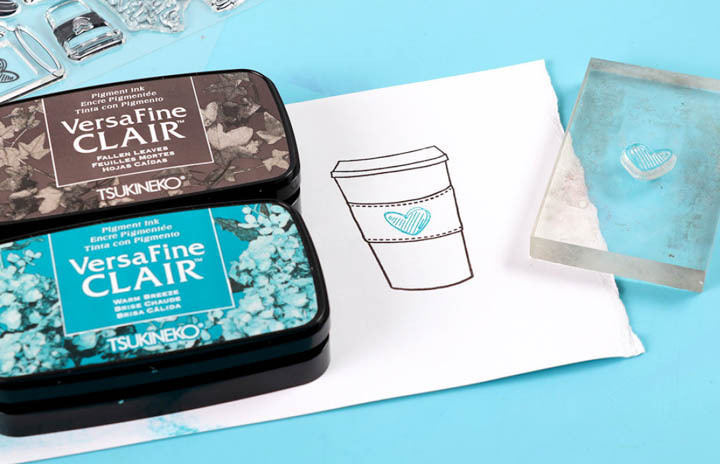 Stamp the coffee cup twice in VersaFine Clair Fallen Leaves onto white cardstock. Then stamp the heart inside it using VersaFine Clair Warm Breeze. 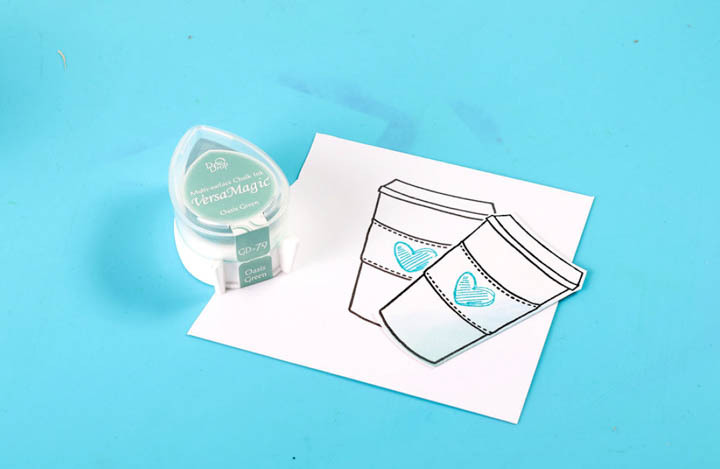 Cut out the coffee cup and ink the edges using VersaMagic. On your second cup, cut out a band and layer it on top of the colored cup using foam tape. Trim the embossed panel to fit onto a plain inked matt and add sewing detail. Adhere the panel to the front of a card using foam tape. 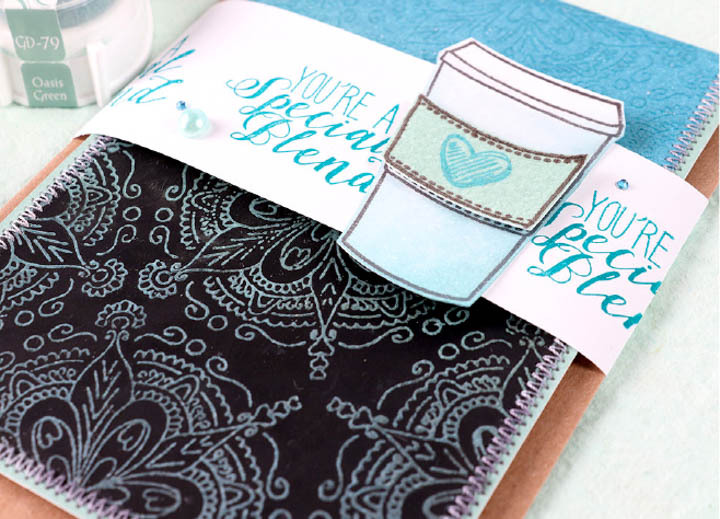 Wrap the stamped band around the card and adhere the colored cup in place. Finish off the card with pearl and diamanté in the same shades as the inks used. This entry was posted in 2018 ARTIST IN RESIDENCE, Advanced, Beginner, Cards, DIFFICULTY LEVEL, DIY, INSPIRATION, Intermediate, Jowilna Nolte, Mixed Media, PROJECTS, Techniques and tagged cardmaking, Cards, Craft Mat, DIY, DIY Inspiration, Embossing, Embossing Powder, Handmade, INSPIRATION, Mixed Media, Paper, Paper Crafting, VersaFine Clair, VersaMagic. Bookmark the permalink.